The Isles of Scilly remain a bit of a mystery to even the most seasoned British traveller. 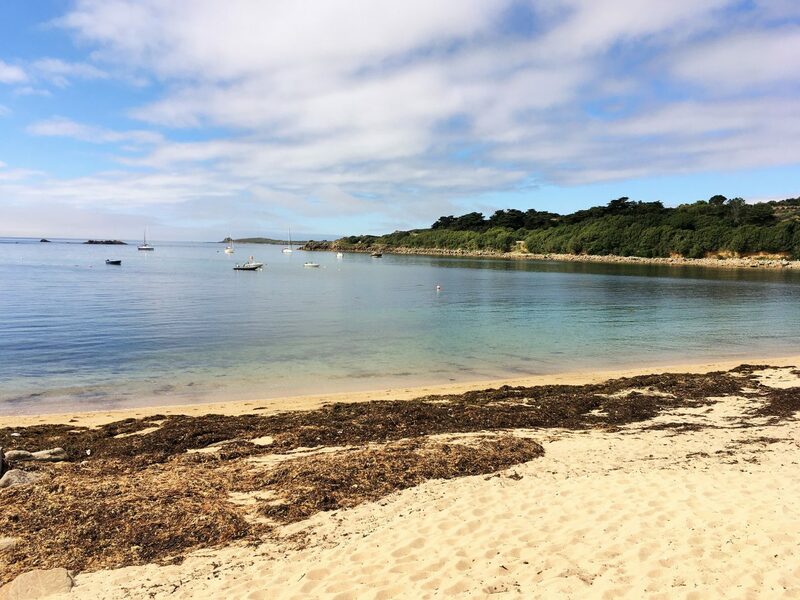 You might know someone who went many years ago or perhaps you’ve seen the Scilly Isles’ turquoise waters and white sand beaches in a brochure or on Instagram. Maybe you’ve heard about the Scillies’ “seaside of yesteryear” appeal or perhaps you just know that the islands are an awfully long way from the rest of England. But what is it really like on the Isles of Scilly? And how do you get there? 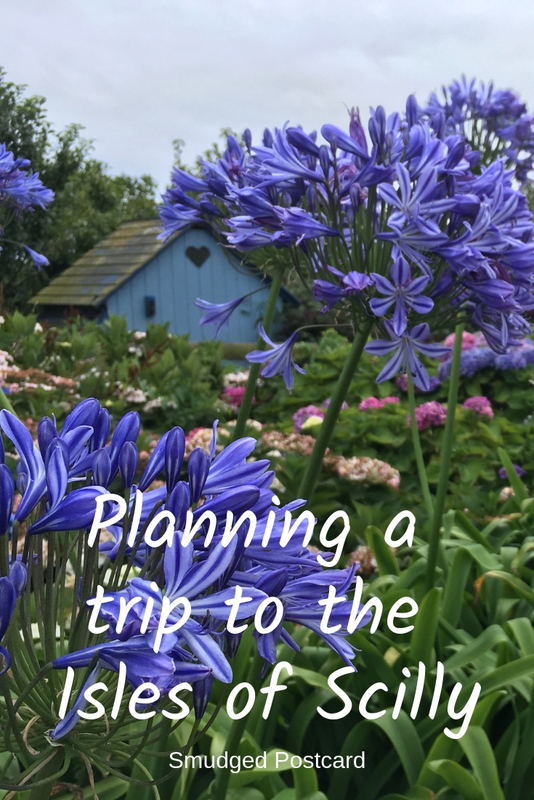 I’ll be answering these questions and many more in this guide to planning family holidays in the Scilly Isles. 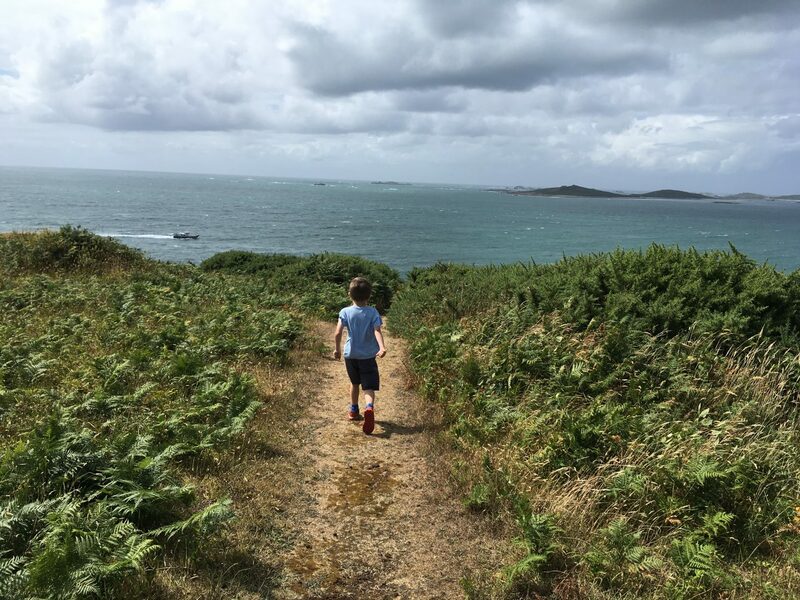 Why do I recommend family holidays in the Scilly Isles? 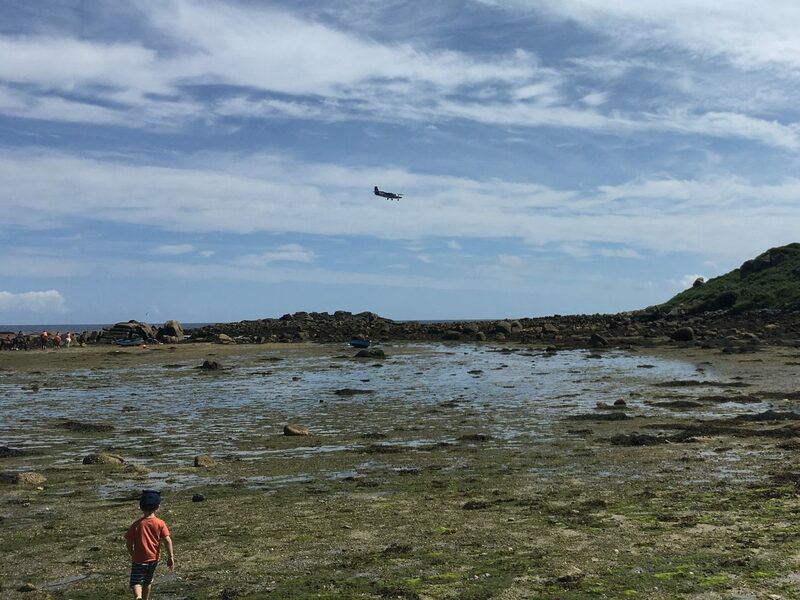 I would sum up the Isles of Scilly as this: a perfect balance of quality time for both parents and children. 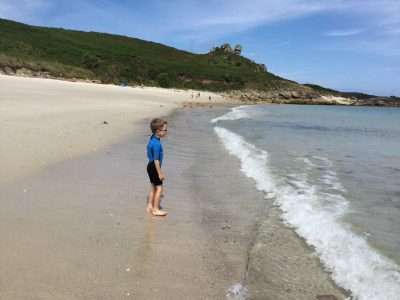 The Scilly Islands are so quiet and safe that children can play independently while parents can truly relax. 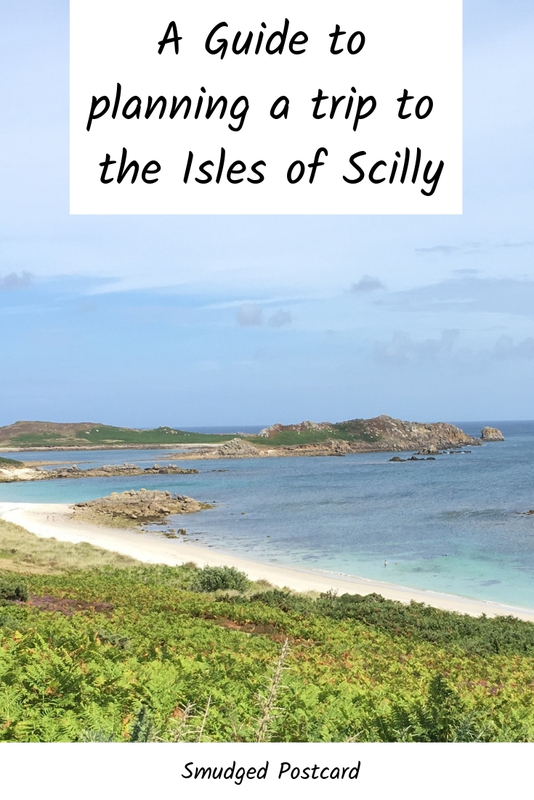 If you’d like to find out more, read my post about why we loved the Scillies. When should you book your trip to the Isles of Scilly? Plan ahead. I struggled to find the right accommodation for our Scilly Isles family holiday ten months in advance (admittedly, we booked three separate units so it was a somewhat complicated requirement). A lot of the best places are very hard to come by as the previous year’s guests get first dibs before the accommodation is released to the masses. I met several families who have been returning to the same place for ten or more years. So, book as far ahead as you can. And secure your means of transport early too. Which Scilly Isle should you stay on? Of the 140 or so isles, there are five inhabited ones to choose from. We stayed on St Mary’s, which is the largest island and has by far the widest selection of accommodation and facilities. Of the total 2,200 Scillonians (Scilly residents), half of them reside in Hugh Town, the capital of St Mary’s. Much of the Scillies’ accommodation can be found in Hugh Town and it’s where the ferries and inter-island boats dock. St Mary’s has some lovely sandy beaches and a surprisingly diverse interior of woodland, wetland and farmland. The other four islands are known as the off-islands. Privately-owned Tresco is the place to stay if you prefer a bit of luxury, its Ruin Beach Cafe overlooking the sailing club had an air affluence about it and the rental properties are a cut above what you’ll find on the other islands. 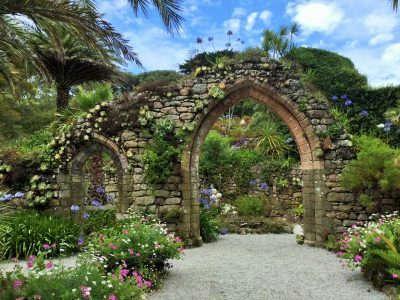 Tresco has some impressive ruins along its coastline and many visitors come to explore the well known Abbey Gardens. Exotic-looking plants thrive all over Tresco and I was surprised by how incredibly quiet it was after St Mary’s… and St Mary’s was pretty quiet. St Martin’s is the island to head for if you’re after those incredible Caribbean-esque beaches. They’re backed by colourful heathland crisscrossed by sandy footpaths. Life is distinctly slower here and the island has just a scattering of houses. If visitors regret taking the term “bare-foot island” too literally, St Martin’s has a shoemaker, you’ll find his tiny workshop (reminiscent of that used by Grimm’s elves) next door to the delicious island bakery. The two smaller isles of Bryher and St Agnes are perfect for a proper escapism experience. Rugged St Agnes is the most westerly isle and has the smallest selection of holiday accommodation, it’s joined by a sandbar at low tide to uninhabited Gugh. 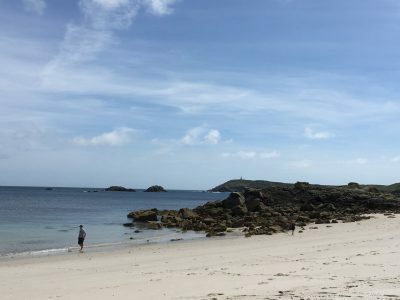 Bryher benefits from its close proximity to Tresco; its east coast is sheltered and perfect for swimming while its exposed west coast is great for admiring the powerful force of the Atlantic. 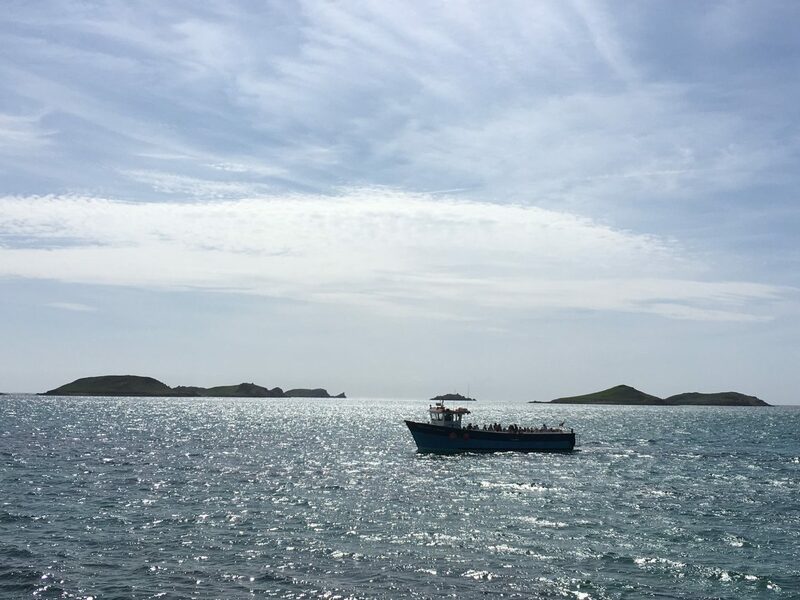 Whichever island you choose to stay on, there are daily boat trips between the isles, journey times are between 10 and 20 minutes. We stayed at 14 Silver Street, a townhouse in Hugh Town overlooking Porthcressa Beach, which was very spacious for our family of four. As our extended family were holidaying with us (but at separate places), everyone would convene at our house for dinner after having an evening drink at the nearby cafe Dibble and Grub across the road at Porthcressa Beach. It was brilliant having everything so close at hand. If you’re used to luxury, fear not. On Tresco there are two collections of luxury cottages (sleeping up to 10) along with an indoor pool and spa. The Star Castle on St Mary’s and Karma St Martin’s are good quality family-friendly hotels. If you’re travelling without children, Hell Bay on Bryher sounds amazing. At the other end of the scale, there are campsites on all the inhabited isles except Tresco. Peninnis Farm on St Mary’s has some lovely glamping units while Troytown Farm on St Agnes features tent pitches overlooking the farm’s beach plus pre-erected bell tents and several holiday cottages. If camping’s not your thing, you can stay at the lovely Longstone Lodge hostel on St Mary’s which is excellent value. What’s the best way to get to the Isles of Scilly? There are currently three ways to travel the 28 miles to the Scilly Isles: by aeroplane, ferry or helicopter. The flights are expensive relative to the distance so if you’re a family it is far more cost effective to travel by ferry even taking into account the additional costs of fuel and pre- and post-travel accommodation. Bear in mind also that the maximum luggage allowance for the flights is 15kg versus 25kg on the ferry. Flights by plane and helicopter depart year-round while the ferry stops operating over winter. Flights can be delayed in cloudy weather, my parents had to wait several hours for their flight back to the mainland in August. 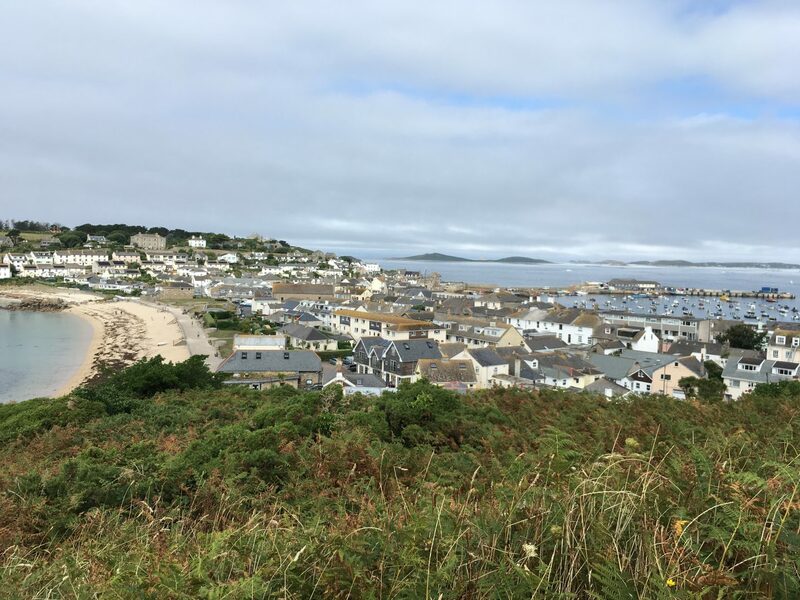 The car journey from most parts of England to Cornwall is slow and rather tedious so if you’re not combining your holiday in the Scilly Isles with a break in Cornwall, it’s worth considering the overnight sleeper service from London to Penzance. It departs Paddington at 23:45 (you can board an hour before) and arrives into Penzance at 07:50 the following morning. It’s around a ten minute walk to the ferry terminal from the station (taxis are available). There’s also a daytime service but the overnight journey sounds more fun and is a great option if you want to maximise your days off from work. The cost to travel to the Isles of Scilly by ferry is approximately £100 per adult and £50 per child. There are several decks and a couple of cafes on board. You get lovely views of the south coast of Cornwall as you leave the mainland. We saw St Micheal’s Mount, the Minack Theatre and Porthcurno Beach, all of which we’d visited the previous week. Whales and dolphins are frequently spotted during the journey although we didn’t see any on our crossings. Yes, it can be a bit of a bumpy ride: my kids were sick on the outward journey as it was quite a windy day. However, they soon recovered and would be quite happy to do it again (the sailing, not the vomiting). If you’re arriving at Penzance by car, drop your luggage and passengers at the dock and then park your car in the pre-bookable car park which is about 1.5 miles away. There is a shuttle service to return drivers to the port. At the port, there are basic toilets but no cafe. Luggage is loaded into big metal containers while passengers board the ferry. It is essential that you pre-book all luggage (eg bikes, body boards and so forth) in advance as you cannot carry large items onto the ferry as hand luggage. 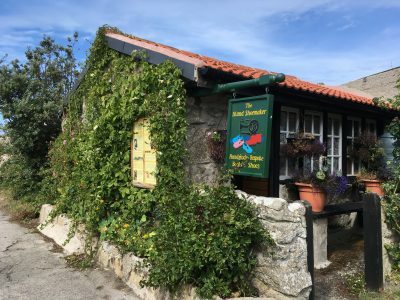 I forgot to pre-book my boys’ bikes and we had a bit of a last minute panic trying to arrange for them to be added on to our booking, the Isles of Scilly staff in their office across the road were friendly and helpful. The general mood at the dock was refreshingly informal and relaxed, quite a contrast to the usual bun fight of peak-time holiday travel. The ferry to the Scilly Isles usually departs at 9:15am so you’ll need to stay somewhere nearby the night before. We decided to spend a week on the Lizard Peninsula in south west Cornwall so we only had an hour’s drive to reach Penzance. On the return journey, you usually arrive back into Penzance at 7.15pm so you’ll need to consider whether you want to book somewhere to stay for that evening or beat the traffic and drive home. Bear in mind that driving through the west country during school holidays is a slow process. Those in the know either drive in the evening or at the crack of dawn. On a “good day”, it should take around five or six hours from London without stopping. We set off from our home in east Hertfordshire at 5am and after a leisurely breakfast in Honiton (the Boston Tea Party does an excellent brunch and has a lovely garden), we had reached the Eden Project by 11am. We were all a bit tired by the end of the day but it was worth it to avoid the notorious Stonehenge traffic jam. Expect to pay per adult return approximately £160 from Land’s End, £200 from Newquay and £336 from Exeter. There is a slight reduction for children. Flights are on 8 or 19 seater aircrafts and you’ll get some impressive views of the islands as you fly into St Mary’s. After a 6 year hiatus, there is once again a year-round helicopter service from Land’s End to the Scillies. A return fare starts at £215 per adult, no reduction for children, infants are £53. Although there is a helipad on Tresco, currently you can only book a flight into St Mary’s. The helicopters can seat 10 passengers. If you’re arriving via the Scillonian ferry at St Mary’s, you can pay a small charge to have your luggage transferred to your rental property. However, if you’re staying in Hugh Town it can be just as easy to walk to your property and drop off the luggage yourself. If you arrive at the airport, there are taxis to take you to your accommodation. If you’re arriving before the check in time, your front door is usually unlocked so you can drop off your luggage. If you’re staying on the off-islands of Tresco, St Martin’s, St Agnes or Bryher, your luggage will be labelled accordingly when you board the ferry at Penzance so it will be automatically transferred at St Mary’s on to an inter-island ferry to your destination. If you’re flying to St Mary’s and taking a boat to an off-island, a taxi will take you and your luggage to the dock. Boats to the off-islands run in the morning and the afternoon so there’s usually no more than a couple of hours wait for your connection. At the dock, there’s a good cafe with lovely views of the harbour and you’ll find left luggage facilities and toilets. The Isles of Scilly are perfect for walking. You’re never more than ten or so minutes from a beach or a cafe. There are proper paved roads on St Mary’s and a few on Tresco so golf buggy and bike hire are popular there, but on the other isles you’ll find mostly tracks and paths. St Mary’s Bike Hire has a good range of bicycles along with child seats, trailers and tag on bikes. Bikes and buggies should be booked in advance. Bikes can generally not be taken on the inter-island ferries although we were allowed to take our kids’ small bikes (useful for Tresco). You can skipper your own boat (there are two operators based on Bryher) or take the scheduled boats to other islands. 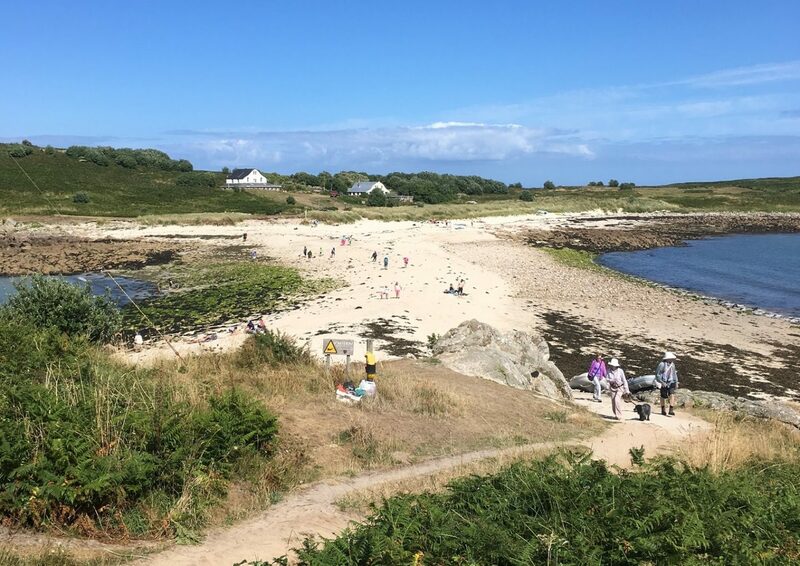 If you’re only staying a few days on the Scilly Isles, the three isles in one day excursion offers a great overview of the Scillies taking in St Agnes, Tresco and Bryher. Try to travel as light as possible due to the luggage restrictions (15kg on the flights). We left half our belongings in the car at Penzance (we’d spent the previous week at a cottage in Cornwall) and it felt quite liberating to just take a few bags with us. There are several clothes shops and a good sized Co-Op on St Mary’s so you should be able to pick up any essentials there. Each of the off-islands has a grocery shop and scattered across the isles are honesty stalls selling everything from chillies to agapanthus plants. We did take our kids’ bikes as I was worried we wouldn’t find one small enough for our tiny but intrepid four year old. The sea is quite chilly so we were glad to have packed our wetsuits. And finally, can you take your dog on holiday in the Scilly Isles? Yes. There were loads of dogs on our ferry to the Isles of Scilly and dogs can also be taken on certain flights. It is a brilliant destination for dogs, some beaches having year round access for your four legged friend. There’s a good range of accommodation which allows dogs. 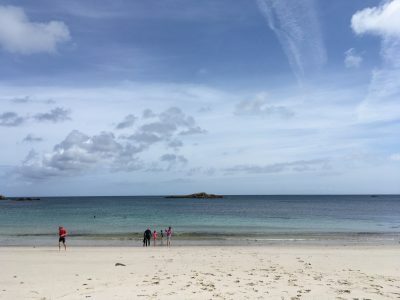 Want to find out more about family holidays in the Scilly Isles? 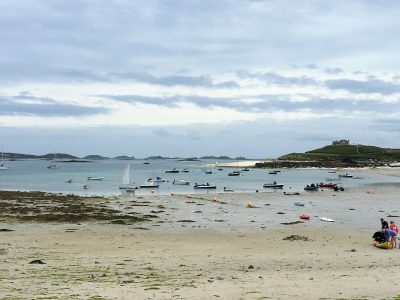 Read about what we enjoyed most on our trip to the Isles of Scilly. 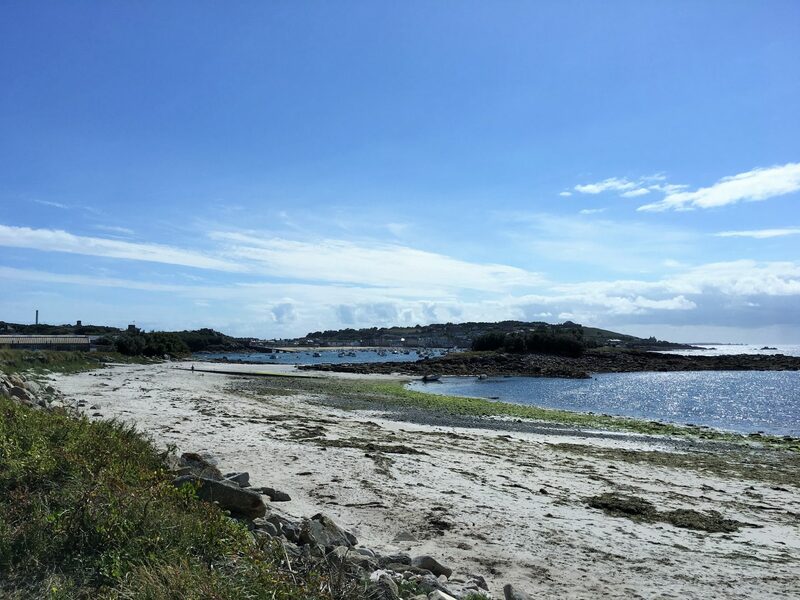 The travel details above were correct as of 2018 but if you’re planning a holiday in the Scilly Isles, please do check with Isles of Scilly Travel for up to date information. Have you visited the Isles of Scilly? Let me know in the comments below. If you’re driving in the UK, make sure you take a look at my post about family-friendly places to stop just off the motorway. It covers everything from play areas to picnic spots, castles to nature reserves. It’s amazing in this age of connectivity that the Scillies remain so firmly off the radar, very lucky too! This is a really useful guide Zoe, I’ve never been to the Scillies. We keep talking about it so I’m bookmarking this. It’s so lovely, my brother has already booked a return visit for next summer! Sorry Annabel, gone mad and called you Zoe!! It looks wonderful, and I have read so many posts about the Isles of Scilly recently too. I love the fact that you feel you can give your children more freedom because it is so safe, this really appeals to me. Great that it is dog friendly too! Yes the safety aspect was really refreshing, really want to go back! The helicopter would be fun and seems quite good value compared to the aeroplane flights! Yes, it’s lovely that they can have some independence. I’ve been wanting to visit the Scilly Isles for a long time – they look so beautiful. 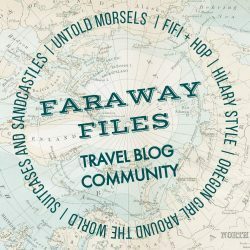 This is such a helpful, informative post as I really didn’t know much about how to get there, what there is to see and do on each island or how to get around. Pinnin for later – I’m determined to get there one day! Book now before it’s full! 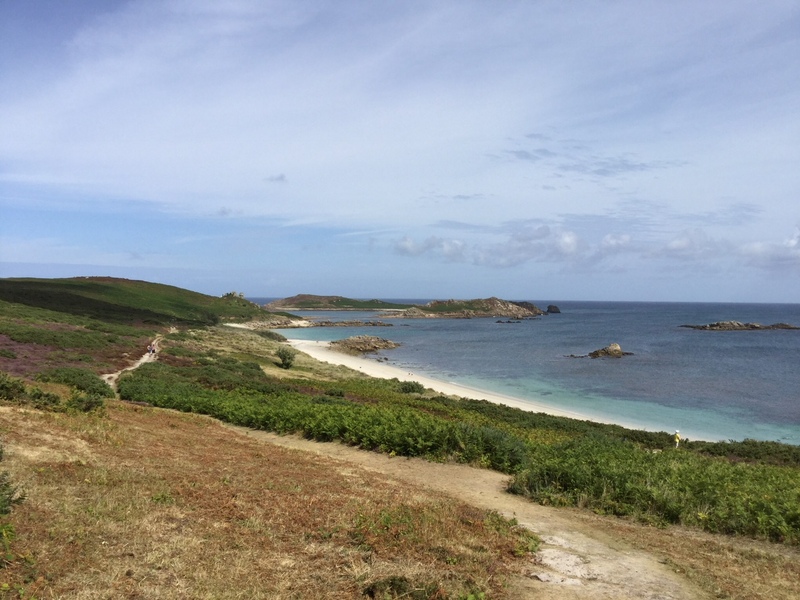 All your Scilly Isles picures and blogs are definitely making me want to get there next year! Sounds and looks absolutely idyllic. What beautiful photography! I’ve head such wonderful things about this corner of the UK, but it always seems such a trek for us to get there. You’ve certainly temped me though!